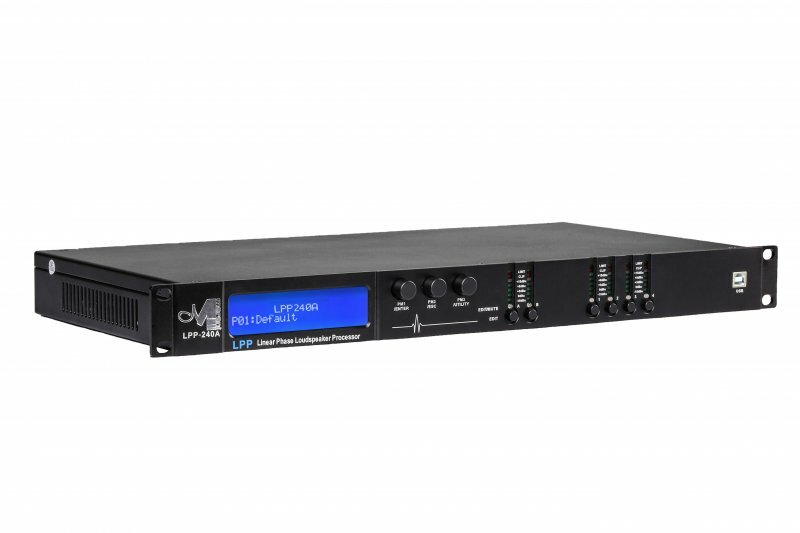 LPP240A is a High End 2-IN/4-OUT digital speaker management system which maintains the same outstanding Sound Quality of the former DPA240A version, but highly improved in terms of DSP processes and added of an astonishing FIR filtering tool set. Designed for maximum versatility, it provides all the processing and control necessary for both live and fixed installation use. Proving for any crossover configuration, it offers 2 analog inputs, 4 analog outputs and 1 AES/EBU input, managed by 2 powerful MARANI® DSP Engines, for a full 96kHz processing, in addition to 24 Bit AD/DA Converters. Each input channel provides a choice of a 13-band Parametric EQ, Gain control, Noise Gate, RMS Compressor, Internal White/Pink Noise Generator, and configurable Delay. Each output offers up to 7-band of parametric equalization, in addition to the IIR crossover filters which themselves provide slopes from 6dB/Octave up to 48dB/Octave. Each output path also features PEAK Limiter, RMS Compressor and configurable Delay. Particularly, the Output X-Over Filtering can be selected to be IIR style, with the complete set of Classic Hp/Lp filters (Butterworth, Linkwitz-Railey, Bessel) or FIR, being for each output channel available a 512 taps FIR filter which can be set as Hp/Lp/Bp. On each one of the 2 Input paths, one more 1024 taps Asymmetrical FIR is available for Phase Correction purposes, where the Coefficients Calculation can be supported by an embedded Wizard tool or can be Loaded from external sources as Third Parties Sw for the FIR filters coefficients generation. Being the phase correction FIR Asymmetrical, a powerful tool for adjusting/reducing the FIR latency is available, allowing therefore the LPP240A to be used without any problem also for Live performances still having the Phase correction FIR running together with the eventual FIR for the X-Over implementation in cascade. The LPP240A supports a full set of matrix mixing modes where Input sources can be routed/mixed to the Input paths, inputs paths may be routed/mixed in any ratio to any output and couple of outputs (1/2, 3/4) can be swapped at pleasure. For remote configuration and control the LPP240A can be connected via USB/RS485/TCP-IP connections. The control remote PC software allows simultaneous control up to 32 units, setting all parameters and showing real time levels. RMS compressors working on Look Up tables for the Compression coefficient are available on Input and Outputs paths. On Outputs a further Peak Limiter is available at the end of the paths. FIR for Phase Correction Asymmetrical 1024 Taps, with coefficients generated by Pc Sw embedded Wizard tool, allowing also FIR latency Adjustment/reduction.